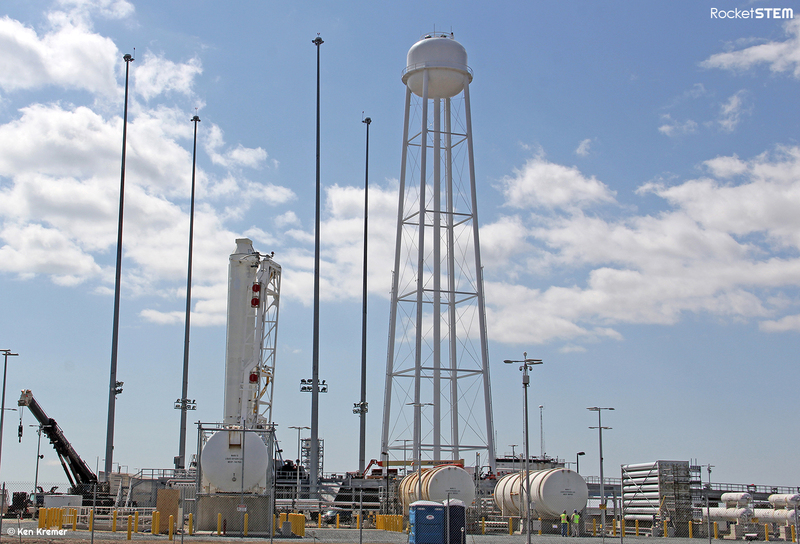 NASA announced that the maiden flight of the private Antares rocket from Orbital Sciences Corp. is slated to soar to space between April 17 to 19 from the newly constructed seaside launch pad dubbed 0-A at the Mid-Atlantic Regional Spaceport at NASA’s Wallops Flight Facility in Virginia. The two stage Antares rocket serves as the launcher for the unmanned commercial Cygnus cargo resupply spacecraft, also developed by Orbital. Both Antares and Cygnus were constructed under NASA’s Commercial Orbital Transportation Services (COTS) program to replace the ISS cargo upmass capability previously tasked to NASA’s now retired Space Shuttles. In mid-March, I visited NASA Wallops for an up close personal tour of the impressive Antares first stage rocket erected at the launch complex following the successful 29 second hot fire engine test in late February that cleared the last hurdle to approve the Antares launch. Umbilical lines were still connected to the rocket. The inaugural Antares test flight is called the A-One Test Launch Mission. It will validate the medium class rocket for later follow-on flights to the ISS. The first stage is powered by dual liquid fueled AJ26 first stage rocket engines that generate a combined total thrust of some 680,000 lbs. The upper stage features a Castor 30 solid rocket motor with thrust vectoring. Antares can loft payloads weighing over 5000 kg to LEO. Orbital won a $1.9 billion contract with NASA to launch at least eight resupply missions and deliver approximately 20,000 kilograms of supplies and equipment to the ISS; similar to the SpaceX Falcon 9/Dragon system. The April launch of Antares which mark the most powerful rocket ever to ascend near the major American East Coast population centers.